TCLF’s documentation of Texas landscapes continues to grow thanks to our partnerships in Houston, Dallas, Arlington, and Austin. Increasing the depth of our understanding of the Lone Star State’s significant historic sites and designed landscapes, the What’s Out There Texas program is poised to add more than 150 properties to our What’s Out There online database. (lower) Dealey Plaza, photo by Barrett Doherty.The program is generously funded by the Edward W. Rose III Family Fund of The Dallas Foundation, The John and Florence Newman Foundation in San Antonio, Marshall and Dee Ann Payne in Dallas, and a National Endowment for the Arts – Art Works Grant awarded in April 2014. What’s Out There Texas has also received a generous pledge from the Texas Chapter of the American Society of Landscape Architects, a named fellowship through SWA Group, and internships with Design Workshop, buildingcommunityWORKSHOP, and the landscape architecture programs at the University of Texas. The inaugural SWA Group Cultural Landscape Fellow Barrett Doherty recently completed his extensive documentation of sites in Houston and Dallas. Working closely with landscape architects at SWA Group and with local preservation organizations, Barrett has developed exhaustive lists for each city comprised of more than 200 properties with significance in landscape architecture. These lists, which include a wide diversity of vernacular sites and historic properties as well as designed landscapes by both well-known and lesser-known regional practitioners, will enable TCLF to continue research well into the future. With designers ranging from landscape architect George Kessler to architect Philip Johnson, the diverse landscape types include suburbs, public parks, college campuses, plazas, and roof gardens. In addition to his research of historic literature, Barrett logged countless hours conducting fieldwork to assess site integrity and capture photographic documentation. In Houston perched above the ravines of Buffalo Bayou, Barrett discovered the detailed work of the first landscape architect licensed in the State, Ralph Gunn at Rienzi House Museum, a terraced property of formal gardens designed in 1952 and now occupied by the Museum of Fine Arts European decorative arts collection. A few miles away, the University of Houston campus blends a formal Beaux Arts plan laid out in 1937 by Hare & Hare with Modernist plazas designed in the 1960s and 1970s by Fred Buxton. 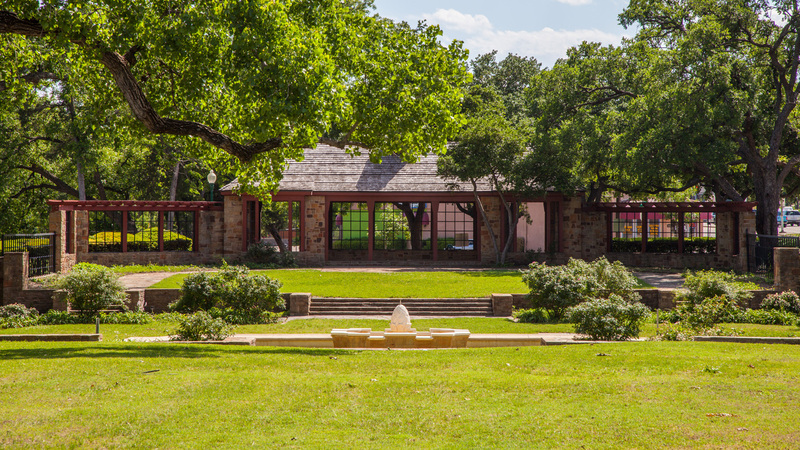 In Dallas, another Hare & Hare project caught Barrett’s eye, the recently rejuvenated 45-acre Lake Cliff Park features a Beaux Arts pergola and rose garden constructed by the Works Progress Administration. In the Design District Barrett documented Decorative Center Dallas, a Modernist shopping center conceptualized in 1953 by Arthur and Marie Berger. Texas Woman's University, photo by Glenn McLain. Upon completion of his Fellowship, Barrett accepted a position with Bluegreen, a landscape architecture firm located in Aspen, CO. On his way from Houston to Aspen, Barrett stopped off in Denver where he photographed a few sites that will soon be added to the What’s Out There database. Meanwhile back in Texas, Glenn McLain is busy documenting sites in the Fort Worth area. Glenn, a Master of Landscape Architecture student at the University of Texas Arlington, is working with Professor Kate Holliday to identify, write about, and photograph a diverse range of vernacular and designed landscapes. In Denton, Glenn recently visited the research gardens at Texas Woman’s University where a chapel designed by architect O’Neil Ford and constructed by students is sited amidst seven acres of historic educational plantings. Another example of Ford’s work in Denton is the sunken Modernist courtyard at the Civic Center, which was designed in 1967 and includes detailed woodwork by Ford’s brother Lynn. In Fort Worth, Glenn recently provided documentation about Burnett Park, originally designed in 1919 by George Kessler. The park was redeveloped in 1983 by SWA Group and Peter Walker and again in 2010 by Walker with PWP Landscape Architecture. The 4.4-acre park provides an important green space in the urbanized core of the city and features a 50-foot tall sculpture by artist Jonathon Borofsky. Completing this round up of Texas work, TCLF is finalizing plans to conduct What’s Out There Weekend Austin in the fall of 2015. An intern from the University of Texas at Austin, William Niendorff, will be working to develop a list of potential properties for the Weekend tours as well as provide photographic and written documentation of Austin’s significant sites. Through these types of university partnerships, TCLF is committed to providing opportunities for students in landscape architecture and historic preservation disciplines. With more than 1,500 carefully vetted site entries and some 10,000 photographs, the What’s Out There database is a tool used by educators and researchers as well as tourists and designers. Beyond its utility for research and inspiration, the What’s Out There program gives students real-world experience in directed research and offers them the chance to hone their communication skills.